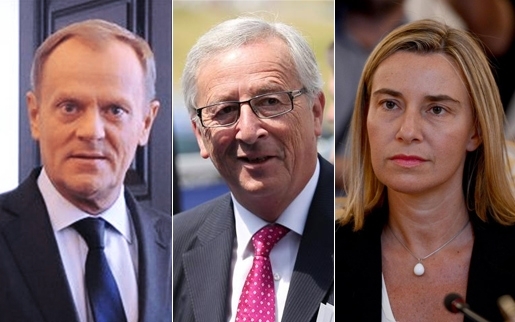 Now that Donald Tusk has officially taken office as new President of the Council, the Trinity of European leadership as provided by the Lisbon Treaty is complete. In due course there will be plenty of opportunity for Euro-scoffers to ridicule the fact that one never really knows who is in charge of the EU. They will point out that European leaders do not ‘speak with one voice’ (yawn!). And they will of course (double yawn!) repeat the old anecdote about Kissinger asking for Europe’s telephone number. The last thing Europe needs is a ‘face’. In the blessed country that I live in, the presidential system imposed by the ill-conceived constitution of the Fifth Republic has poisoned political life entirely and hi-jacked the media. The only thing that really seems to matter is the next ‘face’ of France. It is still two and a half years until the next presidential elections, but the jockeying for position, the scheming, the drafting of scenarios, the polling with regard to who will be the next ‘face’ of the nation has already been going on for half a year already as if there were no other urgent matters to deal with. Faces of the Fifth Republic. The excessive personalisation of political life is the worst opium of masses. In a strange and false candour, editorialists and constitutionalists point out that ‘the French are attached to the presidential function’ (presumably for historical and cultural reasons) and that they would not accept to do without the ‘direct universal suffrage’ of their leader bestowed upon them by de Gaulle who conceived it as a ‘direct plebiscite’ rather than a choice. But nobody ever asks them whether they are not fed up with what they call, in a very funny accent, the ‘peopolisation’ of politics. I dare hardly imagine what a European Union with a ‘real’ president and an election campaign would be like. The whole ‘Spitzenkandidaten’ business of the last parliamentary elections was a double-sided sword and should make the defenders of the famous ‘politicisation’ of the European Parliament think twice. Both process and outcome were debatable, it seems to me. And the repetitive talk about the Commissioners being unrecognisable, interchangeable, faceless technocrats in far-away Brussels is just as much besides the point. Faceless, so what? I don’t want them to spend their time queueing up in front of national television studios in order to make themselves a ‘face’. It’s just as fine if they focus on their mission. If Europe had a ‘face’, the gap between expectations and output would grow even more. Like it has in all presidential systems. Or is there anybody around who is not disappointed by what even a man like Barack Obama has been perfectly incapable of doing? Europe does not need a face. Europe needs courageous political leaders in the Council who dare tell people ‘at home’ that the EU is a complicated thing that will always be governed in a complicated manner. Who stand up and explain to their citizens what supranationalism really means and why it is worth while defending it. 28 real faces, in short. This entry was posted in Current Affairs, Democracy & Citizenship, The EU. Bookmark the permalink.